We recognize this is slightly dated, but still believe there is a need to set the record straight. On June 20, 2012, the Daily Jefferson County Union published an article by Kevin Murphy entitled, “No added prison for Fort man“. This article reports on a Fort Atkinson man who was on probation for possession of an explosive device and recently charged/convicted of being a felon in possession of a firearm. In the article (attached), the Rock River Patriots are mentioned because this individual supposedly attended one of our meetings. Is this a deliberate attempt to smear the RRP using a classic “guilt by association” tactic? We think it may be just that. As anyone who attends our meetings can tell you, they are all open to the public. Many people have come and gone since the group formed several years ago. We have a core group of regular attendees and many others who attend sporadically. None of the leaders in the RRP recognize this person. The RRP were never contacted by the writer of this story for comment either. The article also indicates that the judge told the defendant to avoid groups with “nothing positive to offer” with the implication being that the RRP have nothing positive to offer. We obviously disagree. For the thousands of people who have attended our events over the years, I think they would disagree also. Our group is not a “right-wing” group, and has never advocated violence of any kind. UPDATE: The above article was discussed at our last meeting on June 27th, and the commentary above was sent out via email. 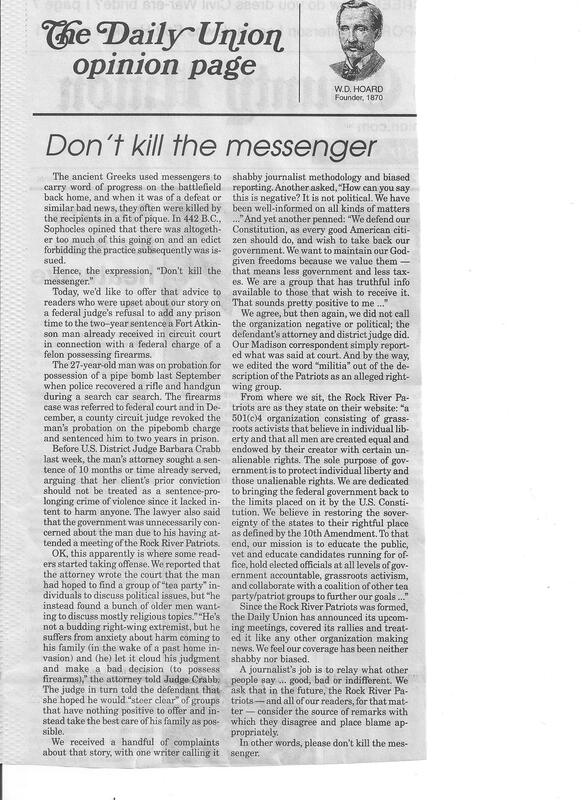 According to the Daily Union, a “handful” of complaints were sent to them about the article which they addressed in their OP ED – Don’t Kill The Messenger published on Wednesday June 27th, 2012. Their OP ED (in summary) states that they were merely reporting what was said. Hence the title, “Don’t Kill The Messenger”. We understand they are reporting what happened in court and have no problem with the Daily Union reporting that. However, we will ask the question, “Why weren’t we ever contacted for a comment on this story, considering it paints the Rock River Patriots in a negative / questionable light repeating allegations that are untrue and/or giving an impression that is false?” At least give us the opportunity to respond to the comments that are reported, and let people make up their own minds. I think virtually everyone can agree on that point. So this leads us to the question of whether or not this was a deliberate omission by the Daily Jefferson County Union. That can be left up to the readers. However, the questions of impartiality that were raised during the recent recall elections must not be overlooked. When Media Trackers reported that a Daily Union reporter covering the Fitzgerald recall and an Editor at the Daily Union signed the recall petitions, the topic of media bias was brought to the forefront. We must couple the signing of recall petitions with an incident that occurred at a pre-recall election TEA Party Express rally in Jefferson by one of the same Daily Union reporters. We were content to let this incident go unreported as the reporter subsequently apologized for the behavior, and we believe his apology to be sincere. However, in light of this recent issue, we think it is appropriate to mention. When confronted about signing the recall petition in a joking manner by one of the Patriots, the Daily Union reporter responded with several choice expletives directed at the Patriot. The reported proceeded to get into the Patriots face , in what appeared to be an attempt to intimidate the Patriot. Other people were in the immediate vicinity when this incident occurred and were offended. Another Patriot who was standing by stepped in and again questioned the reporter’s impartiality. Seeing that the Patriots were not intimidated, the incident ended with the Daily Union reporter eventually leaving the area. The reporter later returned to apologize. We ask the readers to take this information, and make up their own minds about the Rock River Patriots. Our meetings are open to the public. As long as people do not disrupt the meetings, they are welcome to hear what we have to sayand participate. We welcome everyone to stop by our booth at the Jefferson County Fair and receive free DVD’s and information. ATTENTION…Due to the Memorial Day Holiday, there will be NO Rock River Patriots Meeting this Friday May 25th. Many of our members will be out of town on for the holiday weekend. We pray everyone has a enjoyable and safe weekend. We will resume our normal meetings again in June. On June 8th, we will discuss the election results, and view the documentary by the 10th Amendment Center, “Nullification”. On June 22nd, we plan on welcoming back “J.C.” to conclude his presentation on Islam. If you missed the first session, come to this one. We will review the first presentation briefly, and the continue on with new material. Other Upcoming Events…This does not constitute an endorsement of any candidate. The forum will be held in the Jefferson High School Gym on Wednesday May 23rd at 7:00 p.m.
readers, listeners and the audience at the forum. If you have a question, send it in! Below is a letter to the editor of the Daily Jefferson County Union that was printed a few weeks ago. It articulates some fundamental points that are important to know. Enjoy! This letter is a response to Dave Tuten’s letter to the editor on Wednesday, July 28, 2010. At the risk of giving Mr. Tuten’s letter any credibility at all, I will respond. First let me address the tone of the letter. There is no need for any personal attacks against Ms. Bakken or anyone in the Tea Party/Patriot Movement. Mr. Tuten’s letter is hate filled and mean-spirited. It is unfortunate that Mr. Tuten cannot debate without engaging in low-level attacks. Having said that, I would like to address several issues in Mr. Tuten’s letters. Let’s talk about the smoking ban. The issue many people in the Tea Party/Patriot Movement have with this ban is that it is a violation of private property rights. It’s the right of an entrepreneur to decide on his or her premises what is best for their business environment. Whether people smoke in a bar or any other place should be up to the owner of the business. The consumer has a right to make a decision to go into a bar that allows smoking or go to a bar down the street that forbids smoking. The market will dictate which of these owners will be successful. If more people like to go to a smoke free environment, the bar/tavern owner that allows smoking will lose enough business to close or make the change on their own. The ultimate fact remains: it is supposed to be up to the business owner not the government to make those decisions. Mr. Tuten also says “Taking Mrs.Bakken’s logic a step further it would appear that she would support legalized drugs because the government does not have the right to dictate health for anyone.” The Libertarian argument (which I take no position on for or against) states just that. We, as adults, should be able to make our own decisions as to what we ingest into our bodies so long as we don’t harm anyone else. One of the examples used to support their argument is Alcohol Prohibition in the 1920’s. They argue Prohibition created organized crime and gangsters like Al Capone who got involved in bootlegging to make money. The Libertarians argue illegal drugs have contributed the growth of the drug cartels and drug gangs. They argue users would much rather go to a local pharmacy to get their drugs, than to go to a drug house or dealer risking life and limb to get their “fix”. John Stossel and Judge Andrew Napolitano have done extensive programs on this subject, which can be viewed on online at http://www.foxbusiness.com. Again, I take no position for or against the Libertarian argument regarding drug legalization, but want the argument to be stated clearly. The Tea Party/Patriot groups seek a return to Constitutional principles. Many of the Democrats and Republicans have been taking us down the same road, just walking on different sides of it. The true responsibility of the Federal Government is to be an agent of the sovereign States, not the States as agents of the Federal Government. In Article 1 Section 8 of the Constitution, the powers of Congress are enumerated. There are 18 items listed which the federal government is allowed to spend money on. Anything outside the 18 enumerated powers, according to the 10th Amendment is reserved for the States and/or the people respectively. Furthermore, we have the Bill of Rights that guarantees our freedoms such as free speech, gun rights, private property rights, right to due process, etc. However, we have progressives and leftists moving us toward the entitlement/welfare state, and while many people on the right and so-called “conservatives” are bringing us closer to a police state with unconstitutional legislation such as the Patriot Act. Both parties have been taking us down an unsustainable road with out of control spending and debt. Much of the growth of the Federal Government is unconstitutional. That is why understanding of the Constitution is so important. Let’s move on to some of the other issues. TARP is nothing more than a bail out for Wall Street and offshore banks. Why is it the job for the American people to bailout any private businesses? Success or failure should be dictated by the hard work, ingenuity, and innovativeness of the American company itself. The same is true for stimulus spending. Anyone in their own personal life, going through financial hardship including job loss, bankruptcy, etc. would not, without some diminished mental capacity, try to spend their way out of their economic circumstance. However, the government seems to think doing the exact same thing and calling it stimulus will somehow get us out of this economic downturn. This is taking us further down an unsustainable road that is leading to a devaluation of the dollar and eventually hyperinflation. Many economists warn we are facing a double dip recession. The only reason we are seeing a short-term bump up in the economy is because it takes a little while for the market to catch up with the infusion of all the newly printed money into the system. On Cap and Trade…ClimateGate is important because it proves something that the average person already knows. There is no such thing as man-made climate change. The leaked emails pointed to data manipulation. When other scientists wanted to review the data that was used to support global climate change, the data magically disappeared. Unfortunately, the recent investigation into this fraud was commissioned and paid for by East Anglia University, the very school where the fraud occurred. Is it any wonder that they concluded there was “no misconduct?” Carbon Dioxide (CO2) is not a pollutant. From elementary school science we learned that we breathe in oxygen and breathe out carbon dioxide. Using the climate changed alarmists logic, the act of breathing is then an act of pollution. I think you can see the absurdity of this argument. Everyone wants a clean environment but regulating carbon dioxide is definitely not the answer. Should we also regulate dihydrogen monoxide? It sounds like something bad, so we must regulate it right? If you know your basic chemistry, dihydrogen monoxide is water (H20). Many of the scientists who are climate change alarmists are not even climatologists. They are only involved for their own benefit or political agenda. The truth is global warming and cooling has been correlated to solar activity. This is based on the research of Dr. Willie Soon from the Harvard Center for Astrophysics who has been studying the climate for 20 years. Visit our website to see a video explanation. Moving on…Mr. Tuten also asks rhetorically regarding the election of Obama, “How did these radicals get in such a powerful position? Were they not elected by a majority of the presumably regular people?” The answer is simple. The second term of the Bush administration was almost a complete disaster. The Republicans nominated a progressive stooge named John McCain. His flaws were and still are tremendous. He should never have been nominated, notwithstanding his sacrifices while in military service to this country. On the other hand, the Obama campaign, with the mainstream media in the bag, offered this “Hope and Change” and people bought it. McCain seemed like more of the same. However, with the policies that have been enacted and the Marxists Obama has surrounded himself with, many people are waking up. Obama has continued the wars, extended the Patriot Act indefinitely, and continues to take-over more and more control of the U.S. private sector. For too long, the elitists in both parties have been taking the people for granted. We seek a return to Constitutional Principles and a return to State Sovereignty. That is why I believe the Tea Party/ Patriot Movement exists. Furthermore, we live in a Constitutional Republic not a Democracy. There is a very important difference. In a Democracy, there is simple majority rule that can be at the expense of the minority. In a Constitutional Republic, this is not so. The rights of the minority are protected by the Constitution, no matter what popular opinion is. There is a mechanism to change the Constitution by Amendment or Constitutional Convention. However, this is a highly difficult process and should be so. All of this was done to protect the inalienable God-given rights we all possess. Finally, Mr. Tuten says: “tea parties talk about “true patriots” and then talk about 2nd Amendment solutions.” This is an important issue to address. The Tea Party and Patriot groups do not seek or condone violence as a solution as Mr. Tuten would have you believe. However, the true meaning of the 2nd amendments was to protect the people from government tyranny. The 2nd Amendment states: “A well regulated militia, being necessary to the security of a free state, the right of the people to keep and bear arms, shall not be infringed.” Do you see the words, “being necessary to the security of a free state?” The Founding Fathers recognized without the ability of people to defend themselves and their families, men truly could not be free.